The University's first Dean of Students, William F. Field held the post from 1961 until his retirement in 1988. The 27 years Field was Dean of Students was a critical time of growth and unrest, as the University's student population more than tripled in size and the nation-wide movements for civil rights and against the Vietnam War were reflected through student activism and protest on the University's campus. Responsible for ending student curfews and overseeing all dorms becoming co-ed, Field also worked with minority students and faculty to support the Black Arts Movement on campus and the founding of the W.E.B Du Bois Afro-American Studies Department. 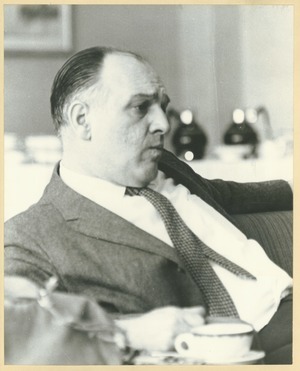 The William F. Field Papers document Field's career as an administrator at the University of Massachusetts and specifically his role as Dean of Students from 1961-1988. The correspondence, memoranda, reports, notes, and other official printed and manuscript documents are a rich resource for one of the most important and volatile eras in the University's history. Of particular interest are extensive files on student protests and activism in the late 1960s and early 1970s and the growing diversity of the campus student population, flourishing of the Black Arts Movement on campus and the founding of the W.E.B. Du Bois Afro-American Studies Department. William F. Field was the first Dean of Students at the University of Massachusetts and not only held the post for 27 years, but held it during some of the institution's most radical growth and maturing, a period known for both student and faculty unrest and activism. Field, a World War II veteran who served as a sergeant in the Pacific, earned a BA from West Chester (PA) State College in 1947, an M.Ed. from Temple the same year, and a Ph.D. in Psychology and Education from the University of Maryland in 1951. Soon after receiving his doctorate, Field began at UMass as a guidance counselor and assistant professor of psychology, becoming the first Dean of Students ten years later in 1961. As Dean, Field saw the student population grow from 7,000 when he began to over 25,000 when he retired in 1988. To meet the flood of students, Field founded the Financial Aid, and Admissions offices, the Student Activities Program, and was instrumental in the development of the University Health Services. He also oversaw the expansion of housing to meet the needs of this growing population, introduced co-ed dorms (1966), and eliminated curfews for all students except freshmen women. Field also saw the student population diversify with the development of the Committee for the Collegiate Education of Black and Other Minority Students (CCEBMS) in 1967 and the first CCEBMS class of 125 students in 1968. Perhaps Field's most powerful legacy as Dean of Students was his handling of campus unrest, specifically during the takeover of Mills House in 1970 and the anti-Vietnam War protests spring of that same year. Since the inauguration of the first CCEBMS class in 1968, black students and faculty on campus had been working with University administration to create a more supportive academic, artistic, safe, and sensitive environment on campus for minority students. When racial violence broke out on campus in February 1970 and the subsequent black student occupation of Mills House, Dean Field worked with faculty and students to not only resolve the unrest peacefully, but helped the crisis become a catalyst to fulfill the earlier demands of minority students and faculty. That spring, following President Nixon’s order to send troops to Cambodia, as well as the trial of the “New Haven 8” and the shooting of four students at Kent State College, student strikes spread across the country. UMass students went on strike on May 5th and occupied the Student Union Building and Memorial Hall. The Strike Steering Committee resolved to have a violence-free strike and arranged workshops on non-violent demonstrations some of which were attended by some fifty state legislators. The administration approved of the takeovers and strongly encouraged peaceful demonstrations. Unlike other campuses where students resolved to violence and bombings, the students at the University of Massachusetts demanded the appropriation of Dickinson Hall, which served as the home of the ROTC, into a daycare center. Dean Field and other administrators are credited for their serious and level-headed approach to student unrest during this period, an approach which helped to prevent crises and protests from spiraling out of control. Though there had been incidents, the relative lack of violence and injuries to students were in stark contrast to many other campuses in the country where students resolved to acts of sabotage which saw the destruction of some thirty ROTC buildings causing millions of dollars in damages. Upon his retirement in 1988, Dean Field said he felt he was proud to leave his job knowing that during the Vietnam War protests, no University of Massachusetts students were arrested or injured. By- laws, Charters, Constitutions (R.S.O. 's): American Institute of Aeronautics and Astronautics, Inc.
By- laws, Charters, Constitutions (R.S.O. 's): S.W.E. By- laws, Charters, Constitutions (R.S.O. 's): UMASS Junior Branch of the International Food Service Executive Assoc. Inc.
Campus Center- Dormitory: "Carkhuff Institute"
Campus Center- Dormitory: "Consider: These are the Days"
Joint Ad Hoc Study Committee- Newspaper Clippings: Lordly and Dame, Inc.
Joint Ad Hoc Study Committee- Newspaper Clippings: L.S.O. Joint Ad Hoc Study Committee- Newspaper Clippings: L.S.O. - "Civil Rights and Civil Liability of Police and Municipal Officials"
Joint Ad Hoc Study Committee- Newspaper Clippings: M.A.R.Y. Olin College- Retire Professional: P.I.R.G. Olin College- Retire Professional: Report- Academic Affairs Committee "Education for Living: A Program for the '70's"
Olin College- Retire Professional: Report- "Changing Role Concepts of College Students"
Olin College- Retire Professional: Report- Student Senate "Open House Policy"
Olin College- Retire Professional: Report- "The Attitude and Opinion of 3595 University Students"
Protests and Demonstrations: Humphrey, H.H. Protests and Demonstrations: Military R.O.T.C. Protests and Demonstrations: Report CC/SU Board of Governors "Concerning the Prohibition of Military Branch from Recruiting"
Residential Colleges: Southwest Residential College-"Project-10"
S.A.R.E.O.- Student Employees: Status of Workman's Comp. Student Senate- Student Union: Student Union- "Design Evaluation of a Central Outdoor Spaceâ€_"
Cite as:: William F. Field Papers (RG 030/2 F5). Special Collections and University Archives, UMass Amherst Libraries.